Protect your valuable biological specimens with CryoLert. This liquid nitrogen alarm alerts you to changes in LN2 levels. Vacuum in vessels can deteriorate over time causing LN2 to evaporate faster. The Fill Timeout switch disables the alarm for 10 minutes during filling. 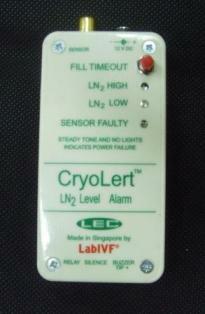 Accuracy of our cryogenic level sensor is +/- 5mm. Supplied with Single Channel Cryogenic Sensor (Standard of 600mm teflon and 600mm PVC, total 1200mm sensor length). Please specify length on ordering or standard shall be supplied. Accommodate up to 6 sets of Cryogenic Tanks for monitoring of low level of LN2. With relay contacts for external alarm, power failure indicator with auto reset. Bench or wall mounting. 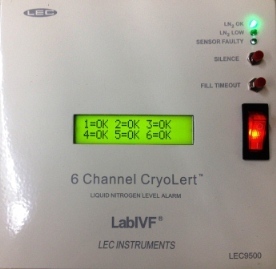 With LN2 fill timer disables alarm outputs, prevent false alarms, tank can be disconnected from the system during fill time. Give an audible and visual alarm in the event of low liquid level i.e. when the thermister is no longer in contact with liquid level.